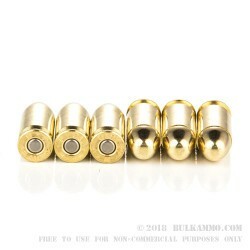 Remington’s UMC line of ammunition is made in Lonoke, Arkansas to provide shooting enthusiasts with high quality factory-fresh brass casings and clean-shooting Kleanbore primers. 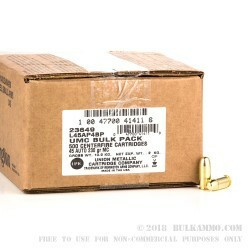 This 45 ACP cartridge from the UMC line features a 230 grain metal case projectile. 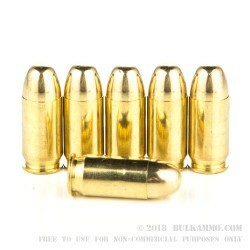 Don’t let its unusual name lead you astray -- a metal case bullet is identical in form and function to a full metal jacketed projectile, and differs only by the name Remington gave it. As such, you can expect this bullet to save your bore against accuracy-harming lead fouling, meaning you’ll be able to shoot a lot of these before it’s time for the old Hoppe’s 9. They penetrate excellently as well, so be aware of whatever is behind your target, and don’t consider this round for self-defense where bystander safety is crucial. The aforementioned factory-fresh brass casing, with its non-corrosive Boxer primer, is ideal for handloading, so you’ll have a half thousand subjects for a lengthy handloading product once you’ve gone through this box.